I have had a busy and taxing week. The Thanksgiving turkey was one of the best ones that I ever produced. If you don't believe me, ask Marley. He ate an entire plate of it when no one was looking. I suffered through Thanksgiving, actually. I have had this awful cold through the holiday weekend and I am still trying to get rid of it. It has compounded the snoring problem. My wife still is mad at me over this even though I trudge to the couch when she notifies me of the problem. She says that I am not doing enough. If I get suicidal, I think I will probably write a note and say I finally did enough to beat my snoring problem and leave it next to my decapitated head on the bed. My mother also had some health issues this week. I thought I was going to be forced to take her into the emergency room. She became disoriented and weak. She also has had a cold/sore throat problems that onely compounded things. Recognizing the problems and remembering the fiasco we went through the last time I took her to the hospital, I decided to try to treat her myself with extra sleep and salt pills. That did the trick and she is back to normal - except for the cold. She has a doctor's appointment tomorrow. Things are calm for the moment, but stay tuned. I am a decent cook. There are two things I make extremely well: chili and roasted turkey. Tomorrow, my new wife and I will be hosting Thanksgiving dinner for our families. There will be a couple of people from her neck of the woods there, and the rest is my local family. It will be quite the spectacle because we have a small cottage of a house. We plan on getting a bigger house in the near future, but for now, it is what it is. The spotlight will be on my turkey for the big day. I opted out of making chili. I can't make both and I already supplied our 90 wedding reception guests with chili just a couple of weeks ago. My turkey, unless I screw up, is very moist and tasty. I used to be disappointed with turkey. I always ate dark meat because I can't stand dry white meat. All my life, I just thought that was the way turkey is. Then one day it happened. I was working at a department store, fresh out of college when a lady brought in some turkey for Thanksgiving. I asked for dark meat, but she said she didn't bring any because everyone loves white meat. I tasted this moist turkey breast and I looked at the holiday in a whole new light. No longer would I be FORCED to eat dark meat or dehydrate myself with white meat turkey as it soaked up every ounce of saliva from my mouth and glands. NO! I WILL LEARN TO MAKE GOOD TURKEY MYSELF. The next couple of years, I researched and experimented till I came up with the goods. 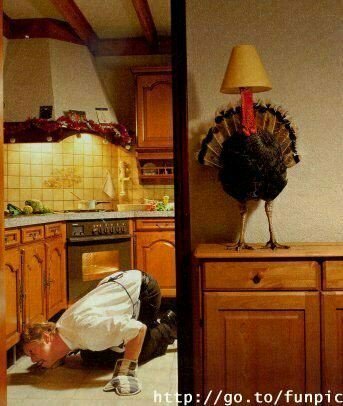 Now, no one in my family even thinks of the possibility of a Thanksgiving or Christmas without Jeff's turkey. I stuff the turkey with vegetables (water-based kinds like celary and onions) so's not to sponge out the bird's moisture. My wife calls me a few minutes ago and says that two people in her office warned her about cooking anything inside the turkey because Salmonella will thrive there. One of these people being a doctor gets her a little worried. I told her that I was disappointed because we all must have forgotten to get sick or die in the years past. Too bad we didn't know about it before so we would know how to act when we digest all that. Happy Thanksgiving and by all means stay away from Salmonella! 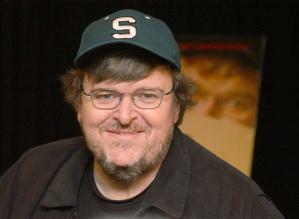 For most people, they either love or hate Michael Moore. I guess I am different. I kind of like him. Sometimes I LOVE him, but other times I don't like him very much at all. I can listen to him without pre-judging that everything he says is either right or wrong. I can listen, be entertained, and judge for myself on a point-by-point basis. Not dismissing someone altogether because you disagree with some or even a lot that he says is just part of being an adult. Today in the US, we have an overabundance of children when it comes to politics. However, for you teens wanting to be grown-ups, it is never too late. Read on and grow! ;) Try not to throw the baby out with the bathwater. you because we value you as our fellow Americans. You deserve to know what we plan to do with our newfound power -- and, to be specific, what we will do to you and for you. encourage you to dissent and disagree with us. business. Love and be in love -- it's a wonderful gift. send your kids off to war based on either a mistake or a lie. are available to you and your family, too. the cleaner air and drink the purer water. every single resource to tracking him down and bringing him to justice. Immediately. We will protect you. age from the moment you were born, not the moment you were conceived. your children just as we would protect ours. conservative women that wage, too. example for the rest of the world. duty as the loyal opposition. fellow Americans -- and for the rest of the world. Last night I went to see the author of Marley and Me, John Grogan, as he discussed his book. I wrote about this book before and how it related to my own dog story. If you forgot or hadn't read it, you can find it here. I finished the book minutes before leaving to see Mr. Grogan. Finishing the book was tough because it brought me back to my own heart-ripping experience with my Griffey. I truthfully didn't know if I could finish it, but I did. Mr. Grogan is as good a speaker as he is a writer. He is just a good story teller and I know that the couple of thousand people at the event appreciated him appearing. After he spoke, he met with anyone that was willing to wait in line to see him and have a book signed. My wife and I waited an hour, and finally had our eight second audience with this New York Times best selling author. We had something signed for our friend, Debi, who couldn't make it because of a class. She was the one that gave us OUR Marley. I told him that while he signed, but he appeared to not really listen. He must have been tired signing all these books at this stop and others. The book had been out for 14 months already. If you are looking for a good story to read, I recommend this book - especially if you have a fondness for dogs. 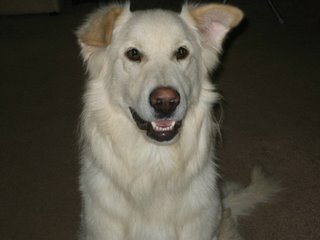 You will see one of your dogs in at least one of Marley's misadventures. If you read it, be ready to laugh and cry. This piece will demand both from you. I don't feel right today. I didn't sleep well, neither did the wife. The snoring problem had disappeared for the most part till last night. It kept her awake and she is even grumpier than I am. Of course, being married, a lot of the reason I am grumpy is because she is grumpy. It is a disease, I tell ya. I have a negative outlook on a lot of things today. A year ago today, a big tornado came through this area and took 25 lives. Now, I am bombarded by the "anniversary" of it on all the TV and radio stations. I think these things should be kept on the down-low. Everything is so hyped up anymore. I lost one of the players I coached in the tornado. I was touched by it. I just don't want to be pelted with it all the time. It is the same thing with 9/11. I am just tired of hearing about it. I think victims of these tragedies should be honored - but quietly and in a dignified way. My wife called me (because she is feeling "weird" today) and a co-worker filled her mind with "it sounds like you are pregnant". Oh brother! She needed me to tell her that it is nearly impossible. I did. I think she feels a little better. We had our wedding reception party-thing Saturday night. It was fantastic. My sister, niece, father-in-law, his friend, my wife and I worked very hard to prepare for it. It couldn't have turned out better. Everyone raved about my chili - which I stayed up the night before making for it. We had everything from shrimp to chili. It was casual, but elegant and decorated with a Jamaican feel. One thing that bothers me a little is that most of the guests were my wife's people. She is shy and has trouble making friends, yet all her work people showed up and many relatives traveled four hours or more to come. I had my immediate family, and an aunt/uncle combination, and about four friends with their families. One person from my work showed up for about 15 minutes. Oh, I guess I can claim our travel agent since I was the one that made all the arrangements. It is sad because all my people live HERE. Oh well, it was a nice time anyway! Every morning on my way to the office, I see a young mother walking her small boy to school. I think the mother is young; I can never see her face. However, the boy seems to be about five years old and the mother always wears an over-sized University of Michigan coat with the hood pulled over her head. She always stops at a corner about a short city block away from the school. The boy continues on alone but passes the crossing guard between the mother and the school. The mother just stands there and watches the boy all the way to the school. Her posture suggests that she is sad to see the boy go and isn't doing too well with the thought that her baby is growing up. When the boy disappears from sight at the school, the mother turns around and slowly retraces the footsteps that brought her there. Her head is down as she goes to face the day without her child - again. This particular morning helped me fill in the blanks that you just read in this little snapshot. The boy started down the street alone, while mom stood there still and watched. Then, about 30 feet away from her, he stops, turns around and sprints back to his mommy, gives her a giant hug, then trots away to his school day. When the child disappeared into the school, the mother turns around and walks back the way she came with a little more life to her step. The following people can consider themselves TAGGED! 1. Grab the nearest book. If you are currently reading something, that'll be fine too. 5. Don't you dare dig for that "cool" or "intellectual" book in your closet I know that is what you were thinking! Two days ago, my wife called her dad and told him that she thinks that we are having an addition to our family. He nervously laughed, "Really? Anyone that I know?" So many things must have invaded the poor man's head. Just two weeks ago he escorted his daughter over a footbridge on a Jamaican beach into my hands where he gave his blessing for our union. Now, he is trying to prepare his brain for grandfatherhood. His daughter answered him, "No, it is a golden retriever." What a relief for him as they both shared a five-minute laugh. The whole thing wasn't much of a laugh for me, though. I had just lost Griffey as you know if you read my Tuesday post. I really didn't want another dog. It is too painful to go through again. I knew after time, I would want to adopt another one, but not yet. Not while my little buddy bowed out just a couple of days before. However, this is how it happened. Debi, a woman my wife works with, adopted the dog on Friday because the local pound was over-crowded and they were putting dogs down at a record rate. This golden's number was due even though he had only been there a couple of days. Her daughter volunteers there at the shelter and begged her mother to step in and save this dog because it was special. When Debi got the dog home, she was informed by her landlord that she couldn't have pets. This was a surprise because other tenants have them, but the policy just changed. Knowing that my wife is a sucker for dogs and sob stories, Debi told her of this dog's plight. My wife responds, "Jeff LOVES golden retrievers!" 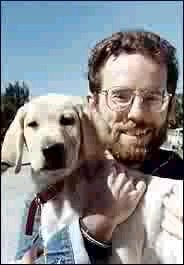 I do love golden retrievers. I had planned on getting one for over a year. However, this Griffey ordeal commanded that my heart wait. I wasn't looking for a replacement and I needed time to grieve. Ah, but the fates do not care. I couldn't save Griffey, but I may be able to save this dog. My wife called me and said, "I have something I need to talk to you about." Wives, NEVER call your husband and say that. It seldom is a good thing. I responded with, "Oh no." I had been through a lifetime of events in the past month and I wanted to cruise for a while. She replied, "No, it is a good thing - I think." Well, you know the rest of the story. Debi named the dog "Marley" after the dog in the book because she recently finished reading it. My wife just finished it and LOVED the idea of "Marley" for a name. Now, I am currently reading the book and trying to get through it before next Thursday when John Grogan, the author, is coming to town to talk about it. 1. I have wanted to get a golden retriever for a while now. 2. I lost my dog and have an empty place in my heart right now. 3. This drops into our lap (with all the shots and checks from a vet for free - which is important since I just spent nearly a grand on Griffey's treatment. 4. The dog is named Marley based on the book that the three of us was reading. 5. The Marley in the book was named after Bob Marley, the most famous Jamaican (all we heard about in Jamaica was Bob Marley). 6. We started our life together in Jamaica and now we are starting our first co-sponsored dog named indirectly after this famous Jamaican. 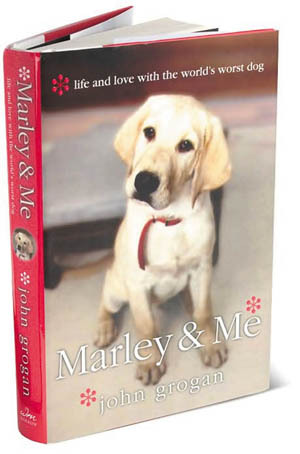 The Marley in the book is a yellow lab, but Debi couldn't resist the name and the story. Plus, the resemblance is pretty good. Marley, so far, has turned out to be exceptional. He is a big, beautiful sweetheart of a dog that I was slow to warm-up to. He doesn't have an aggressive bone in his body and although he has been left in the house alone, he hasn't made one mess or chewed on anything not designated a chew toy. His only fault is his love. He is just brutal with that big tongue of his. Welcome to the family, Marley!